Phil Hart CPT Colombia: Who is in charge? I wrote about the roads last week. I couldn’t figure how they could ship or receive commercial goods in these towns. It turns out the four-hour truck ride was the fast way in. 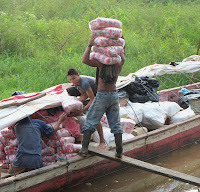 The river system is how the communities are linked together in the South Bolivar Magdalena region. Commerce depends on them. In some ways, security depends on them. As we know, the roads are mostly terrible to non-existent. The rivers are slower, but dependable mostly excepting big floods and the dry season affecting the tributaries. These photos show the biggest kind of freight carrying boat that can get to the town of Puerto Coca and the off loading process. Two guys and a plank. Over the past 25 years revolutionary guerilla groups and private military forces (paramilitaries) moved through the region and set up outposts. Cocaine processors and traffickers set up small labs and airstrips out in the middle of the large areas of subsistence farming. National defense forces moved in sporadically to clean things up, partially funded, of course, by my tax dollars. According to organizations like Human Rights Watch the guerilla presence has subsided, while the paramilitaries, which were disbanded with much fanfare in 2007, appear to have simply restructured themselves into organized crime units in rural areas called “bandas”. In 2009, 80 members of congress, nearly all from then President Uribe’s party, were under investigation for or charged with having links to these groups. That is 35% of the congress. The newly elected president Santos is from the same party. Politicians are known for showing up in these rural areas only before elections. 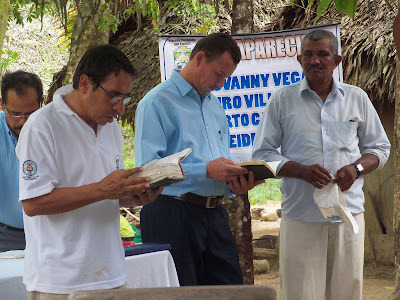 That first trip out in the truck was to accompany people from the small towns of Agua Fria, Puerto Coca, and Coco Tiquisio holding a memorial service commemorating the kidnapping and murders of 4 young men in 2004. The two of the men had been seen being lead away by national security forces. Their bodies were found a few days later, buried in a riverbank. The army denies responsibility and, incredibly, the case has yet to go to trial. A ruling is expected in the next few weeks as to whether the case can proceed. One of the persons we were accompanying is the young lawyer representing the families of the deceased. The persons killed were working one of the many small gold mines in the area. It is suspected they were killed because the local mine operators were beginning to organize themselves to prevent multi-national mining companies from gaining access to their land. One hopeful sign of community solidarity was the fact that the service was conducted jointly by two Protestant pastors and a Catholic priest. Normally the Catholic/Protestant divide doesn’t permit such public cooperation. I have a huge amount of respect for the Catholic priest, Father Rafael. The following day I sat in on a meeting in Puerto Coca. Typically a busy little port town, it was unusually quiet. Fourteen families had moved away since the beginning of December. Rumors were that bandas were demanding protection money, and threatening some individuals. Following a Mass, Father Rafael and another community organizer met with fifteen community members. The goal was to call meeting with what we might refer to as county commissioners to demand that there be some kind of police security provided. Pretty simple. The question was who would go around explain the idea to the rest of the community and try to get them to come. Jorge, the organizer, agreed to talk with the commissioners, and five people volunteered to visit the other families. Several other were simply too afraid participate. One woman said she would join the organizing process only after she saw that they could get people together and the commissioner would actually show up. I’d love to be at that meeting. So, I’ve been thinking a lot about infrastructure… roads, potable water, health clinics, police officers, speedy trials, etc. These things are lacking in Puerto Coca. You can of course get Coca Cola and Direct TV. We mostly take our infrastructure for granted in the US except when we have to pay taxes. The disparity in infrastructure development in Colombia is fundamental in understanding the levels of social injustice in here.